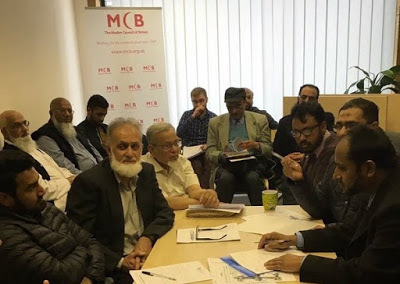 The Muslim Council of Britain starts Independent Inquiry on Aalami Majlise Tahaffuze Khatme Nubuwwat "because of the seriousness and the gravity of the allegations made about the organisation." The Muslim Council of Britain (MCB), some times referred to as 'Muslim Brotherhood' due to its affiliations with questionable Islamist groups and individuals, on Thursday suspended the membership of Aalami Majlise Tahaffuze Khatme Nubuwwat (AMTKN), also known as Stockwell Green Mosque. Last week several leaflets surfaced promoting a 'Kill Ahmadis' message suspected to be a work of AMTKN and Stockwell Green Mosque where the hate organization is located. The AMTKN suspension comes about after MCB found itself being ridiculed for rejecting Ahamdiyyas as Muslims in a statement made in the wake of Asad Shah's murder, an Ahmadi Muslim shopkeeper in Glasgow who, according to the police, was killed because of his religious beliefs. MCB is accused of accommodating individuals and groups, AMTKN in this case, who spread sectarian hatred and promote violence in the UK. AMTKN's anti-Ahmadi pamphlets have repeatedly surfaced in the recent years and many incidents have been investigated and reported in the media. On previous occasions, the Crown Prosecution Service had refused to lodge charges, claiming the threat did not rise to the level that it can be successfully prosecuted. The pamphlets inciting murder of Ahmadis by MCB affiliate re-surfaced in Stockwell Green Mosque following a scandalous announcement by MCB on April 6th renouncing Ahmadis as Muslims because the Ahmadiyya beliefs were at odds with those held by MCB affiliates. Now MCB says an independent investigation panel will "review the allegations [against AMTKN], make findings of facts and recommend any required action." The panel may submit recommendation, according to MCB, either "removal of the suspension order or permanent removal of the affiliate concerned." Under its Constitution, MCB says, "there is of course a right of appeal against any order of suspension or removal." "The order of temporary suspension should not be construed to mean that the Secretary General or his senior colleagues have made a judgment on the allegations made in the media against Aalami Majlise Tahaffuze Khatme Nubuwwat, also known as Stockwell Green Mosque," MCB added. AMTKN, with its roots in lawless Pakistan, is an organization that was setup solely to oppose Ahmadis by all means possible. AMTKN has been repeatedly linked to the murders of Ahmadi Muslims, Ahmadi property destruction, takeover of Ahmadi mosques, and malicious prosecution of Ahmadis in Pakistan using blasphemy law and certain specific anti-Ahmadi sections of the ordinances.